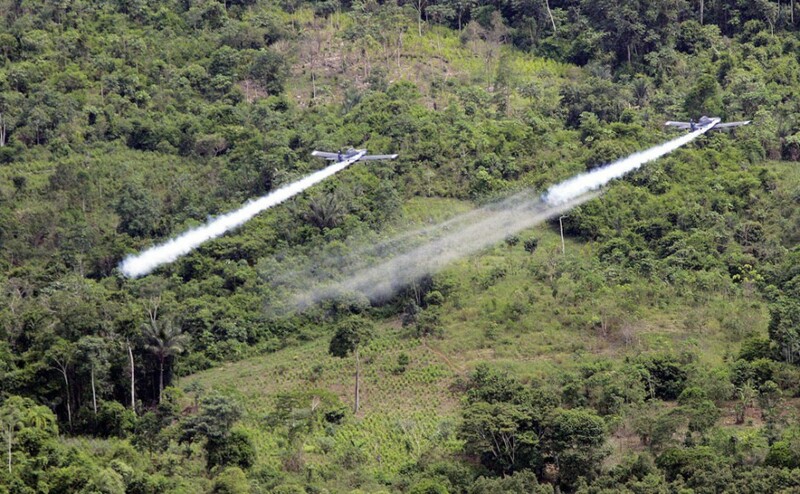 In Colombia, the massive use of aerial fumigation to eradicate coca fields, as part of a strategy called Plan Colombia, has caused pesticide contamination of land and water, and serious health complaints from residents. 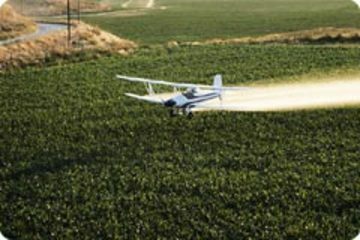 The multinational firm Monsanto is the major manufacturer and retailer of Round-Up Ultra, a type of glyphosate used to fumigate illegal plantations. Monsanto has said this product is environmentally safe, denying any toxic effects on human health or environment. 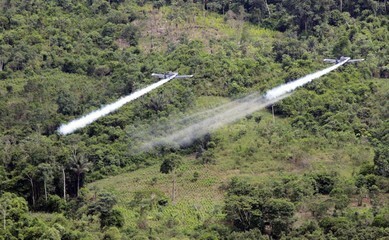 However, local rural and indigenous communities living in Putumayo, and other regions sprayed by herbicides, have reported that indiscriminate fumigation causes illnesses, destroys food crops and contaminates water supplies. The fumigations are to a large extent financed by US government aid programs. Still after more than ten years of aerial fumigations, their main purpose: the eradication of the coca plantations is far from being achieved. In March 2015 the World Health Organization announced glyphosate is “probably carcinogenic to humans.” WHO report fostered Colombian and International associations’ claims. Backed up by the Colombian Health Ministry, the National Drugs Council suspended the fumigations on May 14th 2015 and also announced the constitution of a technical committee charged of changing the national plan fighting against drugs production. From October 1st 2015 the glyphosate fumigations have definitely stopped. Project Details Before the fumigation started the aim was to eradicate 66,000 hectares of coca corps. By the year 2004, there were only 4,400 hectares left. The herbicide used was the glysphosate, which is composed of 74% of water, 18% of salt of glyphosate and 8% of surfactants. The surfactant concentration of one active dose reaches 43 percent, with a dosage of 23, 4 liters per hectare. Fumigations starting at 8 am till 4 pm, with periodic suspensions of a week to fifteen days. With aerial fumigations the compound disperses in the surrounding environment within a 1 km range and stays in the soil for a minimum of 4 months to 3 years. The Monsanto corporation was accused of supplying toxic substances to Colombia, it was charged by the hearing on Biodiversity of the Permanent Peoples Tribunal. Development of Alternatives A new anti-drug policy in Colombia that invests in development and alternative crop programs that provide farmers a path out of the drug trade. Why? Explain briefly. 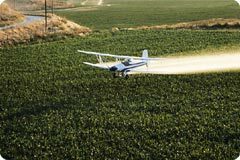 After WHO report asserting the potential risks of glyphosate on humans health, aerial fumigation of the pesticide have ended in May 2015. At the end of 2015, the Colombian National Drugs Council have adopted a new anti-drug policy. The plan considers the relocation of farming families, assisting them to switch crops. Dietrich Heinz. Evaluacion del Plan Colombia en la region andina y el Ecuador. Gonzalez Olga. Las mentiras del glifosato.